Representatives of the governing Partido Popular (PP) and centre-right ally Ciudadanos on the Mesa Directiva executive committee of Congress have voted to uphold a government veto of proposed legislation that would have provided greater protection of renter and homeowner rights and ensure affordable housing through regulation of residential rental prices. The legislation was introduced in Congress in January by anti-evictions activist organization PAH (Plataforma de Afectados por la Hipoteca, or “Platform for People Affected by Mortgages”) with sponsorship from the Unidos Podemos, Compromís, Esquerra Republicana de Catalunya (ERC) and EH Bildu parliamentary groups. 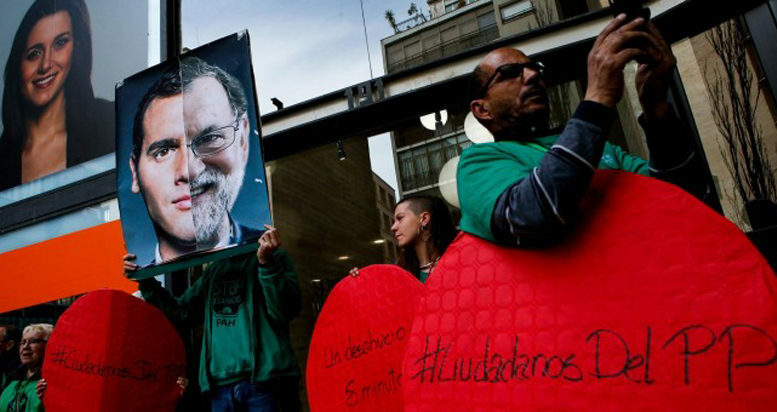 But, repeated maneuvers by the PP and Ciudadanos deputieson the congressional Mesa Directiva managed to block progress on the legislation, which the PAH and supporters have been demanding Congress pass since 2013, when the anti-eviction organization gathered a million signatures of support for the proposal. The PP administration of President Mariano Rajoy announced its rejection of the legislation under terms of Spain’s Constitution which give the government the right to a line-item veto over any measure that requires deficit spending or indebtedness beyond the amounts specified in the federal budget. The government said the proposed housing law was unacceptable because it would cost the national treasury an additional 90 million euros over the next decade. So far in the current congressional session, the PP government has used its constitutional veto power to kill at least 60 legislative proposals from left-of-center opposition parties that would have increased social spending beyond limits established under the government-proposed budget.